A successful eCommerce business has a strong understanding of its target audience and they often use different analytics data to enhance their branding and marketing campaigns. As a clear indicator of what customers want, WooCommerce wishlist data can provide a unique insight into the customer’s needs and aspirations. This data can help businesses to adjust their marketing strategies, improve product recommendations and ultimately drive more sales. In this article, we’ll look into the different ways you can use your WooCommerce wishlist data to improve the performance of your online store. In particular, we’ll be exploring the ability to find customers who have a specific product in their wishlist but haven’t purchased the product yet. We’ll also discuss some practical use-cases of when this can be useful. Wishlist is a popular eCommerce tool that allows customers to create a list of products they would like to purchase in the future. Every time they browse the products on your online store – they can click the “add to wishlist” button and add any product they like into their wishlist. This is very convenient from the customer perspective. It provides them a way to create a list of “bookmarked” products that they have an interest in, but are not ready to buy at the moment. This list of products is available to them at any time in case they want to do some wishlist shopping. Wishlist is a popular eCommerce feature that allows customers to create a list of products they would like to purchase in the future. Besides the obvious benefit of improving the customer’s shopping experience, wishlists can also provide a much deeper, strategic value to online retailers. As a shop owner, wishlists will help you discover trends and popular items in your store. By analyzing your wishlist data, you’ll know which products have the potential to increase in demand in the future. You can use this data to optimize your store by noticing (soon to be) popular products, offering promotions and discounts and managing inventory. Let’s look into how wishlists works in WooCommerce and how you can use the wishlist data to optimize your WooCommerce store. WooCommerce, as one of the most popular eCommerce platform, provides wishlist functionality via plugins and extensions. The two most popular WooCommerce wishlist plugins are the YITH wishlist plugin and the official WooCommerce wishlist extension. 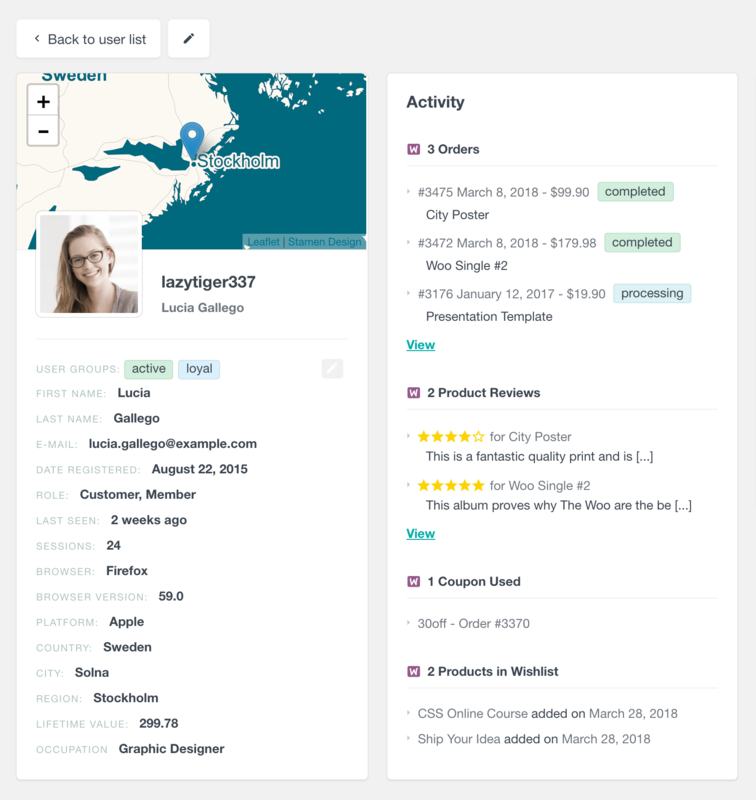 The WooCommerce module of Users Insights comes with support for the both of them. 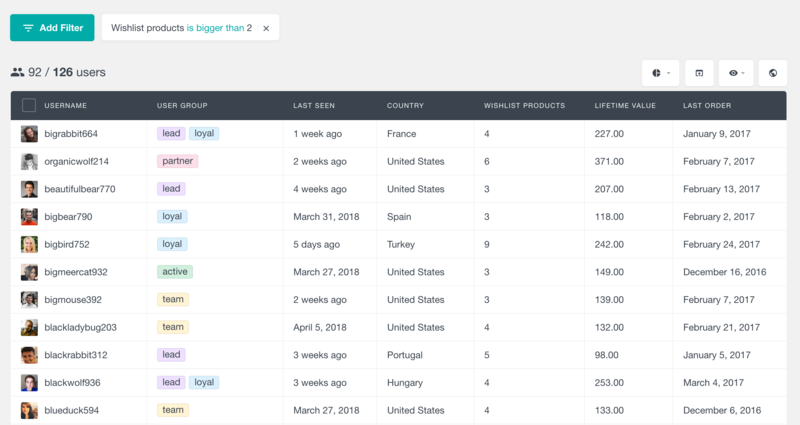 This makes the wishlist data of your WooCommerce customers available to you so that you can search and filter your customers by the products they have in their wishlist. There are two filters available. You can either filter customers by the number of products in their wishlist or you can filter them by the specific product they have in their wishlist. Let’s look into the different wishlist filters. Now that we have a list with all the customers who have this product in their wishlist we want to make sure they haven’t already bought the product. To do this we just need to add an additional filter “Ordered products exclude” and select the same exact product from the product list. You can take this one step further and fine tune your customer segment even more. For example, if you are planning to use this customer segment to send and promotional campaign for this product, you might want to send the campaign only to the recently active customers. Let’s say, only the customers who have visited your WooCommerce store in the last 6 months. By using your customer’s wishlist data you can start noticing patterns in the different products that they have on their wishlist. For example, if you notice a pattern where a lot of your customers who have the same two products in their WooCommerce wishlist. You can use this information to combine these products into bundle offers that you can offer a discount if bought together. 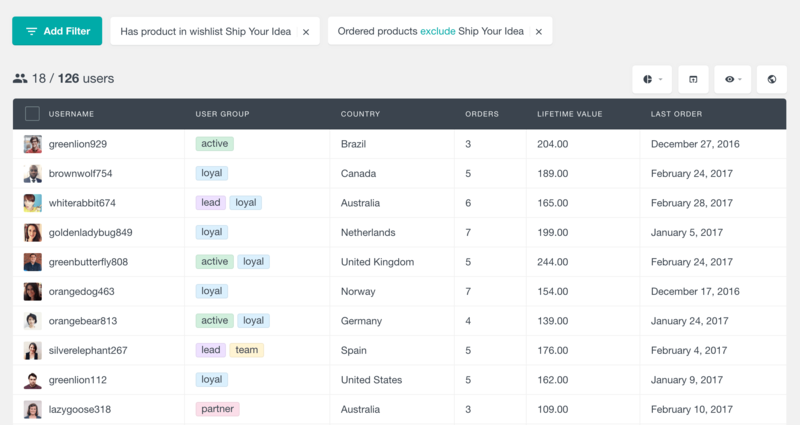 You can now order the user table by the number of ordered products and go through your customer’s wishlist data and see if you’ll start noticing patterns in your customer’s wishlist. Another way to find products that are commonly together in your customer’s wishlist is to combine two “Has product in wishlist” filters. By using the second filter you are basically apply an additional filter to an already filtered list. This allows you to only show customers who have both products in their wishlist. To make sure that these customers haven’t already ordered the product, it is always a good practice to apply another filter that excludes those customers. 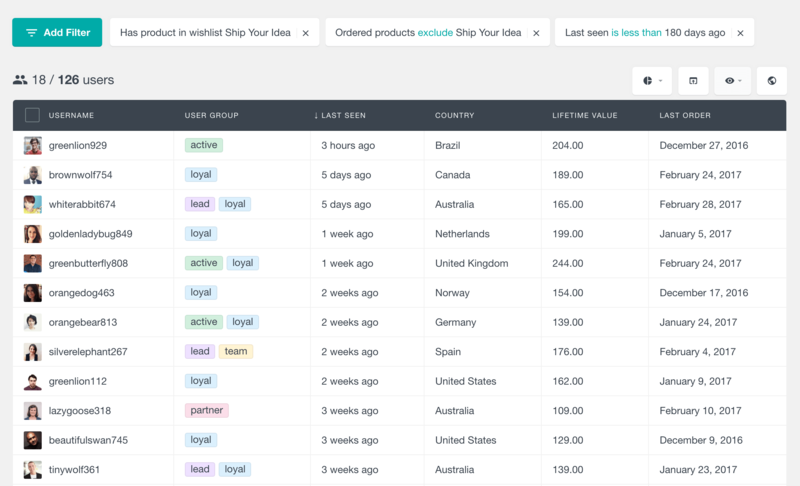 Now that you have your customer list, you can either save it as a Users Insights segment to use it later or create your own custom CSV export that you can use in your email campaigns. As the number of customers using mobile devices to research and purchase online will continue to grow, wishlists will become more and more important. A large number of the customers will use their tablet or smartphone to do a research before they decide to make direct online purchases. Having a wishlist feature is just another way to help your customers not to forget about your products. Additionally, as you can see having access to your customer wishlist data can be a useful tool to help you better understand your customers and improve your shop performance. By combing your customer wishlist and purchase data you can get many different insights into your customer’s preferences.